As Rio 2016 draws to a close, we’ve taken a step back from Team GB to reflect on which retailers have been jumping on the Olympics brand-wagon over the last two weeks. Unsurprisingly, there’s been no shortage of quality real-time marketing going on across social media. In the Twitter category, we spotted Teapigs celebrating its favourite South American brew - Yerba mate - with a 20% off discount. 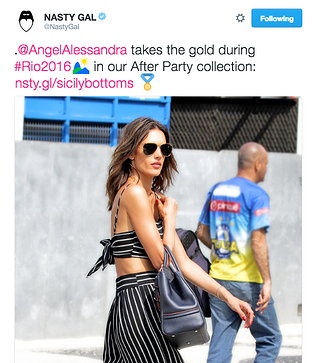 Nasty Gal also got involved in the twitter game, publishing a photo of model Alessandra Ambrosio wearing the brand’s Sicily striped pants in Copacabana. Over on Instagram, the gift store for dog lovers Peace Love Paws deserves a medal for its Go for the Gold sale - available only to its newsletter subscribers. New Balance also gave a quiet nod to the Games with a snap of “Team NB’s“ Álvaro Negredo holding his new kicks. We could go on, but now it’s time to get down to business. From Rio to retail, here are the stories all you ecommerce marketers should have read this week. Two months ago, Instagram revealed in a blog post that new business tools would be “coming soon”. Free feature for accounts that want to be recognised as a business. Includes a “contact button” which enables businesses to choose how customers get in touch (call, text, email), as well as get directions. Business profiles also “unlock access to insights and the ability to promote”. A tool giving businesses “actionable information” about their followers and “which posts resonate better than others”. Lets businesses on Instagram turn well-performing posts into ads within the app. 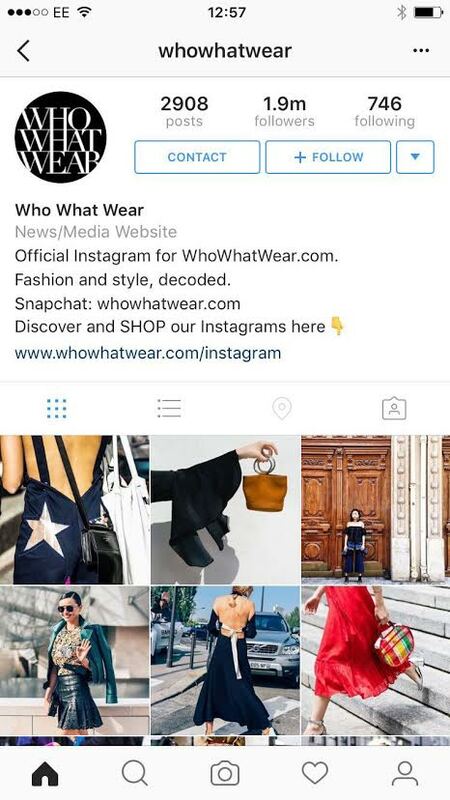 Enables users to choose a target audience or “allow Instagram to suggest targeting for you”. And now all these exciting tools are actually starting to be rolled out. It has been reported that they were subtly introduced in the US, Australia and New Zealand in July, and are now being deployed in Europe. They are expected to be available to more countries within the coming weeks and hope to be available across the globe by the end of the year. Sony Pictures Entertainment has become the first brand to use Snapchat’s new 360 video ad format with a 10 second campaign for its new horror film Don’t Breath. According to the drum,the new ad format gives Snapchat users the option to ‘swipe up’ to watch the 360 degree version of the trailer through a web page link inside the app. The ad is reportedly being introduced in the US first, and should be available to users in Australia and the UK in the next couple of weeks. “Audiences increasingly expect more from us and, as a result, digital marketing departments now have more access to provide high quality content to satisfy this thirst for engaging content through the mobile phone…”. In a bid to help brands bring their stories to life, Pinterest has launched Promoted Video. The new feature hopes to help businesses not only share their ideas with the rest of the world, but show how to bring those ideas to life. The social networking site has adroitly coupled Promoted Video with featured Pins - listed below the video - so that those inspired by what they see can simply “click below to do more with your products and services”. So far, Pinterest has tested the new tool with 12 early partners, including cosmetics brand Garnier, Universal Pictures and food brand Old El Paso. According to Pinterest, a study carried out with Millward Brown showed that General Mills’ Old El Paso witnessed “significant brand lift metrics”, and that Promoted Video ads were four times more memorable than a non-video ad. Promoted Video is available to US and UK based businesses currently working with a Pinterest account team. Dating app Grindr has made its first steps into the world of ecommerce, launching a new menswear line this week. The proceeds from athleisure range The Varsity Collection will go to the Principle 6 campaign, a cause that tackles homophobia and transphobia in the sports world. Grindr ingeniously used its own platform to create a buzz around the launch, partnering with Paper magazine to search for aspiring models for its premier editorial shoot - the casting taking place in the platform itself.